This one is the most puzzling ( to me at least!) 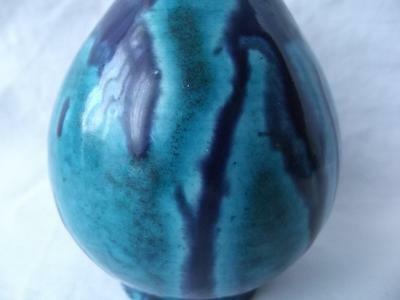 It is a small Pear shaped vase that stands at only 5 1/4 inch tall. 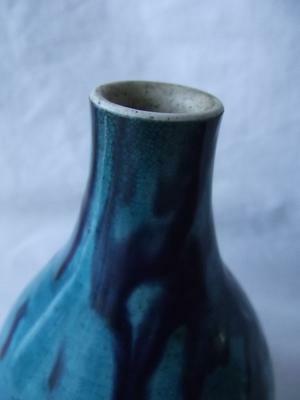 It has a glaze of Turquoise and Cobalt blue. It has a short neck ( dont think reduced) and a white glazed mouth. 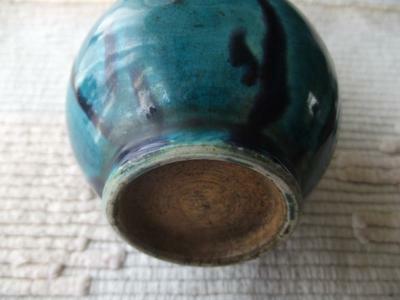 The glaze is very strange I can only describe as drip glazed, it has a small foot with an unmarked ( that would be too easy) and again unglazed base. The glaze up close is quite beautiful with what must be thousands of miniscule bubbles that gives the impression of shading. I have looked at hundreds of pictures of pear shaped and gallbladder Chinese vases but not seen this glaze or size. I am beginning to think is is not even Chinese to be honest! I am VERY confused by this one. 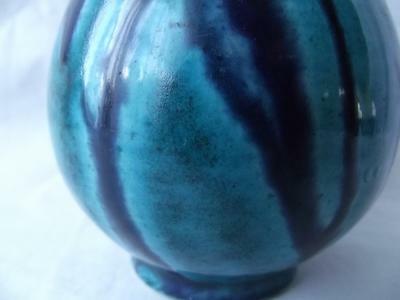 I will send several pictures including close ups of the glaze and hopefully you may have some ideas on it. Comments for # 3 Pear shaped vase. When I took the photos they were taken before I had given it a quick wash over with cotton wool and water. This I did yesterday and I was surprised at how filthy it was. Yes, the neck was something that did trouble me and on closer inspection it does have something about it that does suggest that unfortunately some time in its past it has been ground down, perhaps refired as you suggested as the pin didnt seem to penetrate a great deal( and i really went at it some)but it has a more rough feel to it. This would explain why is does look abit squat. That was very helpful advice and one all of us should remember. Yes, the glaze is very different to what I have seen and you confirming this does leave more questions. My gut feeling is that it is Chinese especially now we have determined that the neck should be longer. BUT as you mentioned we go back to the glaze. 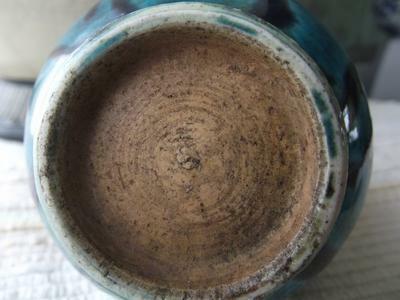 If it wasnt for the glaze, from the research I have done i would have concurred that it would be from the Kangxi period. 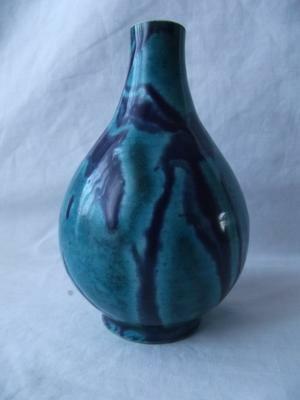 I have seen very similar vases with the same form ( albeit longer neck) size ( I suppose miniature) and base with just a plain turquoise glaze that are said to be of this period. I have also read somewhere that these smaller pieces were made to show how a bigger 'made to order' type of vase would look like. I suppose under the same principal as apprentice/ miniature furniture pieces. Is this correct? 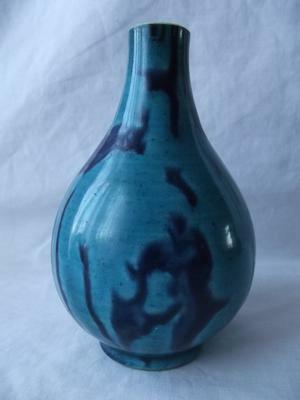 So, being a bit fanciful here ( out on a limb if you like) is there some possibility that perhaps this vase could be Kangxi with a one off experimental glaze? Please feel free to shoot my ideas down Peter, i am very open to all suggestions! One of the first things that came to my mind upon seeing this was also the question if this could be from somewhere else...I haver never seen such a decoration on Chinese porcelain, although theoretically it would be possible that it was made in China. The neck was obviously ground off. This usually happens when the mouth area has been damaged. Is it really glazed on the rim? That would mean it must have been refired afterwards. The neck should be at least some 3cm longer, normally. From the picture it looks as if the whitish rim on top was rough, unglazed. If there is something transparent on top, try sticking a needle into it or scratching it. 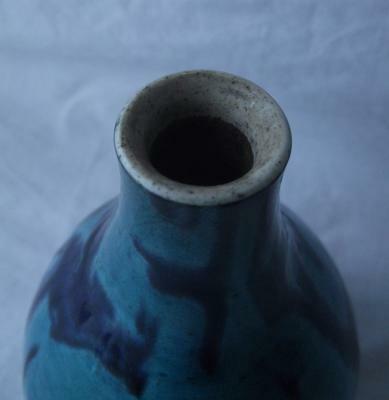 If it is fired glaze, this will not harm it as the vitrified glaze is very hard. If a needle penetrates or scratches it, then it means lacquer or some other matter was used to imitate a glaze.